Photographing the northern lights can be challenging. But with the right astrophotography gear and a few aurora borealis photography tips under your belt – plus some sound knowledge of when and where to best see the northern lights – it’s possible to capture the twisting, pulsing green arctic light of the aurora borealis in all its eerie, extraordinary beauty. As DSLR camera sensors have become more sensitive, this dazzling natural light show has become increasingly popular with photographers in recent years. But how easy, really, is it to capture the aurora borealis? Here's everything you need to know about how to find and photograph the the northern lights. Otherwise known as the aurora borealis, the northern lights are a phenomenon caused by electrically charged particles from the sun slamming into Earth's atmosphere and causing ripples of visible energy above the Arctic Circle. Drawn into the polar regions by the planet’s magnetic force, the discharged particles collide with Earth’s magnetic field in the upper atmosphere – posing no threat to humans. Where are the northern lights? The northern lights generally appear as a horseshoe-shaped oval on the night-side of Earth. Although the aurora borealis waxes and wanes from north to south – and can occasionally be seen from Scotland and northern England – it more or less coincides with the Arctic Circle. So, to maximise your chances of seeing the northern lights, you need to take a trip to places within the latitudes of 64º and 70º north. For North Americans, Alaska or northern Canada are the obvious places, while in Europe it's Scandinavia and, more specifically, northern Norway and Lapland. However, Norway, Finnish Lapland and Swedish Lapland can be very cold in winter. A much warmer place to see the Northern Lights is Iceland – thanks to the Gulf Stream – which also happens to be a landscape photographer's paradise. Thanks to ever-improving air links and infrastructure, it’s incredibly easy to plan a trip to photograph the northern lights. You can find the cheapest flights available using services like Skyscanner, while companies like Europcar offer competitive daily car hire rates worldwide – just don't rent a car at the airport if you want to keep prices down. Is there a northern lights season? Yes, though don't make the mistake of thinking that the northern lights only happen in winter; that's merely when there's more darkness. While the peak viewing season is from October to the end of March (with displays oddly strong around the Spring equinox), it's possible to see the northern lights in August, and even into May. The northern lights are often visible as soon as twilight sets in – which in the Arctic Circle can be as early as 4pm in mid-winter. The phase of the moon isn't so important, and it's perfectly possible to get images of the northern lights during a full moon. However, the effect will be dulled, and if there's snow on the ground, long exposures will make night-time shots appear like like daytime images. That can be a positive, but it’s nevertheless sensible to plan a trip a week or so either side of a new moon to maximise darkness. Can the northern lights be forecast? The northern lights are always there, though their intensity is difficult to predict. The best place to start if you're looking for a northern lights forecast is the website of the Space Weather Prediction Center, an offshoot of the US National Weather Service, in Boulder, Colorado. There's also the Europe-based Aurora Service. As with any kind of outdoor photography, patience and perseverance are everything. A massive solar storm is a magical thing to witness, but it's just as likely you'll have to make do with a weak display. When a display is weak, sometimes the only way to check that a grey-ish shape is a cloud or the northern lights is by photographing it. After all, your camera is so much more sensitive than your eyes. However, what stops people from seeing the northern lights is usually proper cloud (which is common in the Arctic, often for days on end). So never visit a region known for northern lights for less than a week. Even then, you may only get a few hours of clear skies on one evening – but that can be enough to witness a once-in-a-lifetime magnetic storm. As with any kind of outdoor photography, patience and perseverance are everything. First, you'll need a decent astrophotography camera. Go for as wide-angle a lens as you can, and always put your camera on a tripod, because photographing the northern lights is often about long exposures. Set the aperture to as low as possible (in region of f/2.8 to f/4.5 is fine) and put the white balance on cloudy or automatic, before fixing the focus at infinity. Check the focus every few shots, especially if you move the tripod, and use a shutter delay/remote release to avoid camera shake. What you need more than anything else, however, is thorough knowledge of how to operate your camera's settings quickly while in total darkness. You can leave the aperture alone, but being able to change the ISO and exposure settings will make a huge difference if you're lucky enough to experience a strong, fast-moving display of the northern lights. See below for more on this. A car is also useful for driving into areas away from artificial light, which are surprisingly common even at resorts and hotels that claim to be hotspots for the northern lights. Scout out an iconic location in daylight, such as a waterfall, a mountain vista, or a church. If you need to hire a car, Europcar offers competitive day hire rates worldwide. What camera settings should I use to photograph the northern lights? The settings for ISO and exposure depend wholly on what kind of northern lights display you're experiencing. If it's a greenish glow on the horizon or a fairly static band of green overhead, the ISO can go really high – say ISO 1600 or 3200 – and exposures can be 20 seconds; any longer and the stars will blur. With these kinds of shots, composition is everything, so try to compose a landscape photo that will be enhanced by the presence of the northern lights, such as shots that include mountains or buildings. If you do have static northern lights directly above you, get ready: at any moment things may start moving really fast and become very bright. Phenomena like flickering curtains and pulsing 'auroral flowers' are incredible things to witness, but they move so fast that they’re difficult to photograph. Composition is less important here because you'll probably be shooting straight upwards. Try bringing the sensitivity down to ISO 800 and reducing exposure times to a second or two. That way you'll get lots of fine detail without overexposing bright sections of the northern lights. Always shoot in Raw format so you can enhance your images afterwards in Photoshop or a similar program. Just don't oversaturate them to boost their green colour – that's a rookie mistake that so easily make your images look fake to experienced photographers and sky-watchers. Some people say that displays of the northern lights won't be strong again until the mid-2020s when our sun reaches the peak of its solar cycle. They occur most frequently when the sun is at its most active – solar maximum – which last occurred in 2014 and will next come around 2025. 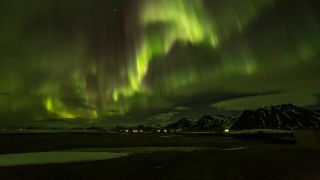 However, while really strong displays of northern lights might be becoming less frequent, it’s a slight effect, and magnetic storms still occur frequently enough to see and to photograph. Besides, really strong displays aren't necessary for incredible photos. Whatever kind of northern lights display you get to experience, it's technically a relatively easy undertaking, and a great excuse to get outdoors with your camera to attempt some spectacular images.